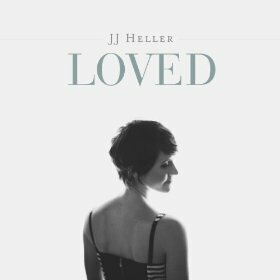 Books, Bargains, Blessings: Review and Giveaway: JJ Heller's Album "Loved"
Review and Giveaway: JJ Heller's Album "Loved"
Available for purchase today is J.J. Heller's new album, "LOVED". I had never heard of her until I was asked if I wanted to do a review of this album, but just one listen to a sample song and I was hooked. This video, "Who You Are" seems to be just life going about as normal. Lately my mind has been thinking about friends who lost a child some years back. I am sure if you ask them, life is still just putting one foot in front of the other. The lyrics of this song are haunting. God "lost" His Child. This album clocks in at just under 39 minutes with 10 songs. They are beautiful both in style (although some are a little more rockier with drums). The lyrics are even stronger than the songs. One of my favorite songs is "Redemption" The chorus says "We're alive for the very first time". Isn't that the way redemption feels? Knowing that, as it also says in the song, "Everything broken will be whole again". That's pretty much beyond our wildest dreams, right? Knowing what is cursed is redeemed, what is broken will be made whole. It's a comforting thought, and lends itself to a wonderful song. The whole album is to give hope for what can happen in the future. Our world is full of hurt and pain, but someday. . . someday in Heaven if not before, we will be made whole, restored, and filled with joy. This album reminds of of what will be while we're still in a world filled with pain. Yet it's not pithy, but touches on real human emotion acknowledging hurt, grief, and disappointment. JJ Heller and her husband, David, did an excellent job of writing these songs. She sings lead vocals, he does background vocals and the acoustic guitar. I haven't been a big fan of contemporary Christian music the last few years, but if this album is any indication of what may be on the horizon, I am looking forward to the future! I really loved this album, and I highly recommend it. And I have a copy to give away to one reader of The Radar Report. Open to the USA only, 18 and older. Winner has 48 hours to respond or another winner will be chosen. Giveaway ends March 24 at 11:59 pm Eastern. Hey! Love JJ already follow her on twitter and you! Leaving a comment! Thanks for doing this! I watched" loved" and just loved the support shown for people in their time of hurt. I watched a you tube video of her singing If You Fall and I loved it. Beautiful! I watched "Loved" - I love how authentic she is! My favorite video of JJ Heller is the boat song! You can't help but smile watching that one! I love her music and would love the chance to win this album! Just watched "Who You Are," and it brought tears. Took me back to 1999 when I got word of my husband's fatal accident. I didn't (still don't) understand, but I knew Who He was, and that's what got me through. I LISTENED TO WHO YOU ARE AND SHE HAS A WONDERFUL SINGING VOICE. WONDERFUL LYRICS TOO.